Hit the road in the Wicked Wahine for some Southwest Spring Break fun. With such a short amount of time off together, we wanted to hit what we could and cram as much as possible into the time we had. This is one of our favorite areas of the US and there was so much we didn’t get to which leaves open the opportunity for more future adventures in this area! It’s a tricky thing though, traveling through here as you can encounter sub freezing temps and snow or 115 degree days. 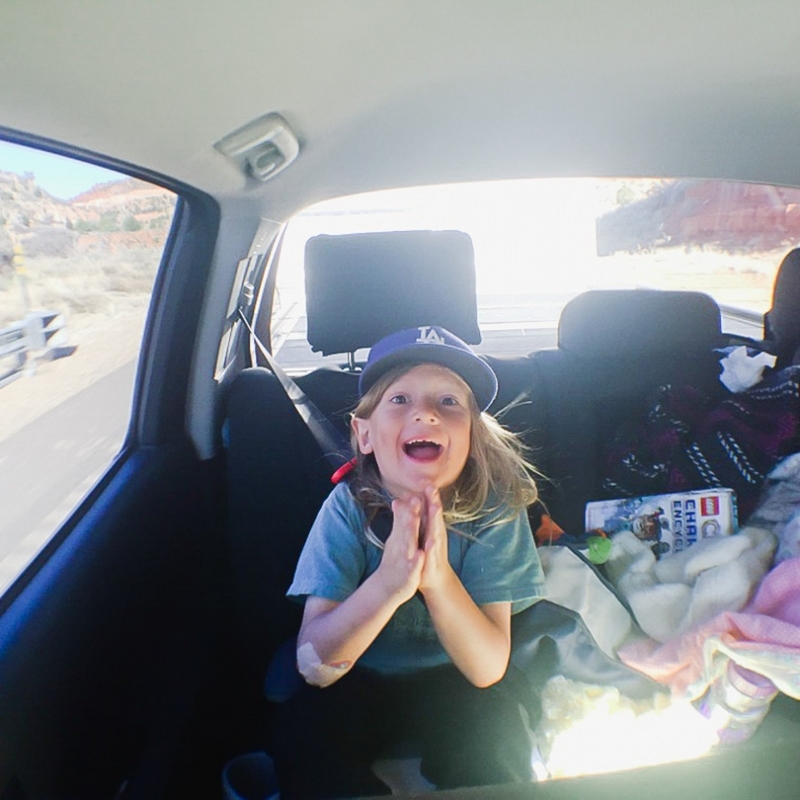 We made the mad dash from Sacramento to Zion where we had reservations at the Watchman Campground, one of the only campgrounds INside the National Park. 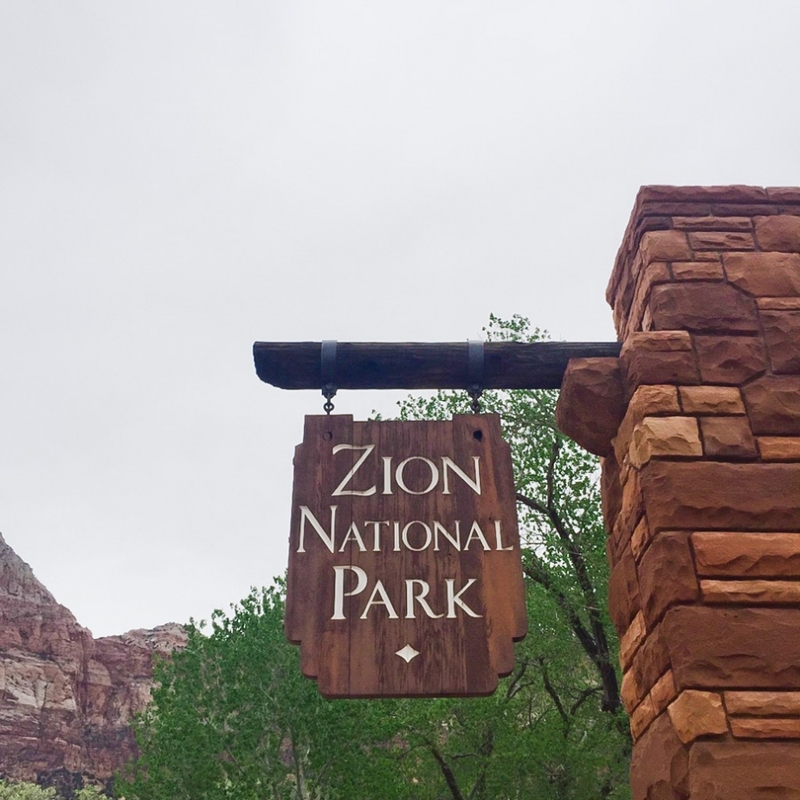 The only way to get around inside Zion is to take the shuttles so I will give only one word of advice with regards to this area…be the absolute FIRST ones on the shuttle, even if that means standing in the freezing, cold dark with your children who are still asleep. Worth it. The lines for the shuttles as we returned from our time inside the park were insane. Early bird gets the empty shuttles. You heard it here first. The amazing thing about this campground is that THIS was our view from the trailer. Making breakfast outside looking up at this? Seriously? The morning view from bed. We journeyed inside the park to hit up a few hikes including the Emerald Pools trails HERE and HERE. There are a few different options on this trail to add more mileage and scenery so see the links for more details. I don’t think it really matters which route you take, they are all spectacular, AND being the first ones in the park on the very first shuttle means you will have the place nearly to yourself. The stunningly gorgeous evidence of time gone by in the rocks will have you yearning for answers we may never know. The trail itself up to the roles was pretty challenging and everyone did awesome! Because why on Earth would you hike without a bobcat in your backpack? This is the last section of switchbacks before the chains appropriately entitled “Walters Wiggles”. Made it to the top for a break! This is one I will be showing them when they are teens and constantly bickering. Look…you once loved each other! Clark and I took turns going to the end and it was quite a heart stopper. More than anything, it was the $#%^&* unseasoned tourists who have NO hiking or climbing experience combined with NO personal space awareness that made it the most challenging. Even though we hit this trail at the earliest possible time, there was still a slew of people going to and from with 90% of them having no business whatsoever on that mountain. Do I sound judgy? I’m ok with tha. Regardless, it was an epic experience that everyone should do at least once in their lifetime! A few pretty narrow spots with 100 foot drop offs on each side. Don’t worry, I was careful and there wasn’t a lick of wind to blow my stick figure over. Def. not for the faint of heart…yes, this is the trail. At the top enjoying the magnificent views of the valley! Gorgeous end to a bucket list hike! Terrible pic but love their happiness here! Made a super quick stop at Horseshoe bend just to check out the sites. It was literally…during one of the worst dust storms I’ve even been in so we didn’t stay long. The whole sand in your eyes and lungs thing is not fun. See what I mean about the dust storm. I wish I would have gotten a picture of the inside of the trailer when we arrived at the Grand Canyon. An inch thick layer of dust and sand on EVERYTHING. The ol’ 68′ Wicked Wahini is not air tight. We stayed in the South Rim of the Grand Canyon at the Mather Campground which was scenery far removed from the canyonlands type of landscape that you associate with the Grand Canyon. This campground was lush and teeming with wildlife with a shuttle stop right at the check in kiosk. Perfect for hitching an easy ride to trailheads! If you haven’t read Terry Grosz’s book “Wildlife Wars“, it’s worth a read. Although not written in doctoral type verse, the stories of his life as a game warden will entertain and amuse all outdoorsmen/women. Hit the ground running with a the South Kaibab Trail. When we stepped out of the trailer, it was nineteen degrees. NINETEEN degrees so we bundles up good for descent into the canyon. But of course not me, I wore shorts as usual. Ha! This is def one of those trails that you keep the kids mountainside and within an arm’s reach at all times. My fondest memories of these days will be the times we had as a family exploring the trails of our beautiful world. After hiking this trail the kids decided they are def fans of hiking UP first as opposed to hiking down. Me too. We always bring in coloring and drawing stuff to restaurants to keep us all entertained while we wait for our food. Sometimes the art is…um…interesting to say the least. I don’t have any idea the reasoning behind the books she packs for trips. I just take pictures of them. Ok. So this place was a distant memory of Clark’s from when he attended as a kid so he was on a mission to take us all there. Boy was it AMAZING. It’s called the “Deer Farm” in Williams, Arizona and it’s a sort of rehabilitation place for deer and a gazillion other animals. The deer run wild and you are basically bombarded with them. Of all the places we’ve visited, the kids enjoyed this one the most! Look at these cuties! SQUEEEL! Dorky shot through the windshield but this was a pretty sweet place as well! Bearizona! If you are in the area (Williams, Az) and you like animals even a little bit…GO! Like caverns and weird stuff? Head on over to Grand Canyon Caverns off Route 66. This place is a TRIP. Inside the caverns is a bedroom/living room/kitchen type of suite that you can spend the night in. Def want to come back for this! Kids were enthralled!! Hitting up s few cheap hotels with pools in warmer weather to cure their water obsession. Last morning in the trailer…sigh. How we gear up for summer!